In February, 2016, the Financial Accounting Standards Board (FASB) issued a new standard that requires tenants to recognize most rental contracts on their balance sheets. This is a significant change from the existing standard for lease accounting. 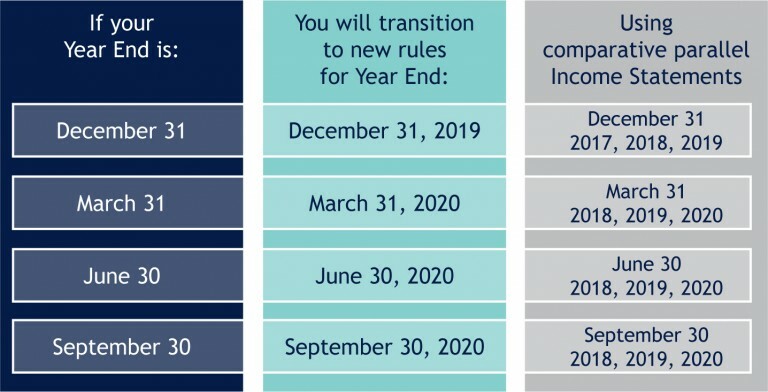 The new standard is effective for interim and annual reporting periods beginning on or after December 15, 2018 for publicly traded companies and December 15, 2019 for all other companies. Companies may adopt the standard earlier, but must also adopt the new revenue recognition standard as well. Because leases will be recorded as Right-of-Use Assets and Liabilities on the balance sheet, companies should consider the impact on related financial ratios. This may have an impact on debt covenants. Additionally, depending on the way the lease is structured, it may also have an impact on EBITDA. All leases will need to be evaluated and recalculated which will require a significant time commitment from internal or external resources. The proposed change would eliminate off-balance sheet accounting for leases. Virtually all leases currently accounted for as operating leases would be brought onto the balance sheet as right-of-use assets with a corresponding liability to recognize the obligation to pay rents. Leases will be categorized as Finance leases or Operating leases vs. Capital leases or Operating leases. Categorization will be determined by using the same general criteria as is currently used, with one additional test. If the lease is for a specialized asset with no alternative use for the lessor, it will also be considered a Finance lease. The new lease assets and liabilities will be recognized based on the present value of the unpaid lease payments which will be made over the life of the lease. Finance leases will be amortized generally on a straight line basis over the shorter of the lease term or the useful life of the Right-of-Use Asset. Amortization expense plus interest expense results in a front-end loaded lease cost (similar to a mortgage) and will have a negative impact on earnings in the early years of the lease. For Operating leases, the right-of-use asset will be amortized on a straight-line basis and the lease obligation will be decreased utilizing the effective interest method. The renewal options and contingent rents will be evaluated on a reasonably certain basis and may be included in the calculation of the assets and liabilities. Lease renewal periods and contingent rents will need to be reassessed on an ongoing basis and the related assets and liabilities trued up as decisions change regarding properties in the portfolio. Leases must continually be evaluated. No more get it and forget it strategies. Significant changes in identifying the restated financial statement impact as well as the ongoing changes from straight-line rent expense to the newright-of-use concept. Impact on debt covenants may be significant. Companies may consider purchasing real estate vs. leasing real estate due to the loss of off–balance sheet accounting. Do you have the right resources identified to assist in the evaluation of new transactions and the related impact on the financial statements? As the demand for information to support the new accounting rules increases, efficiencies will be derived from having a database system in place to efficiently process ongoing entries as well as changes in assumptions which impact the financial statements. IT will be involved in analyzing new systems. CHANGES ARE COMING. ARE YOU PREPARED? Is your company prepared for the impact these changes will cause? The following questions will help you decide where your company stands with respect to proposed changes to lease accounting standards. DO YOU HAVE THE DATA AVAILABLE TO PREPARE THESE NEW LEASE ACCOUNTING ENTRIES? Are all of your company’s leases abstracted into a database which can be used to analyze the impact of the proposed lease accounting rules? Does your company have all renewal options included in the database? Have you identified all contingent rental payments from the individual leases? Has your company identified the systems and processes which will be utilized to keep this information current? Are systems in place to provide information for required disclosures? DO YOU HAVE THE PROCESSES DESIGNED TO CONTINUALLY UPDATE THIS INFORMATION? Has your company reviewed how information flows today and will the current system be sufficient for the future? Do you have the necessary expertise in house to address this issue? Have you considered using an outside consultant to assist with this evaluation? E Smith Realty Partner’s Lease Administration team understands the value of a well negotiated lease. As an outsourced partner, our lease administration professionals work tirelessly to ensure your lease agreements are adhered to by the landlord. Our team members have performed lease administration for clients in retail, industrial, o ce, restaurant, and healthcare. Our team can is agnostic in database solutions. When E Smith Realty Partners centralizes your lease information, you will have complete con dence in the accuracy of data to strategically run your business. E Smith Realty Partners is a premier commercial real estate services company representing national clients. The company is built on the standards embodied by our team: integrity, excellence and making a positive impact in the communities we touch. E Smith Realty Partners leverages many years of collective real estate development, investment, brokerage, design and construction expertise into building a world-class services company.